Cape Town – As South Africa enters strike season, Cabinet has urged business and labour to negotiate their way through the period expeditiously and fairly. Minister of Communications Nomvula Mokonyane told reporters in Cape Town on Thursday that Cabinet discussed this week’s national strike, the bus strike as well as public sector wage negotiations. The negotiations between the Department of Public Service and Administration and the Public Service Association of South Africa at the Public Sector Coordinating Bargaining Council come at a time when the labour market is preparing to implement the country’s national minimum wage. The wage negotiations are ongoing, but have faced the threat of collapsing and disintegrating into a public service shutdown over labour's rejection of the offer. 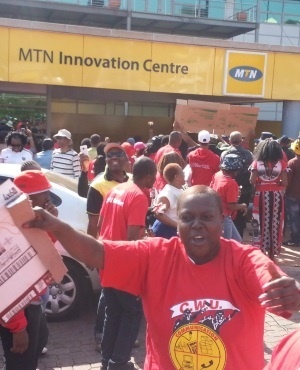 While labour federation Cosatu has been pliant on the matter, the South African Federation of Trade Unions (Saftu) has sought to rock the boat by demanding more than the proposed R20 per hour for the national minimum wage. Saftu gave government until Wednesday to reconsider and reevaluate the R20 figure, saying it would lower many workers' wages and widen income inequality. The figure would be subject to adjustment on an annual basis if the draft laws concerning the national minimum wage are passed into law as they stand. This year's public sector wage negotiations have been marked by unions dismissing proposals from the employer, primarily the Department of Public Service and Administration. Unions have even hinted at a potential public service shutdown if their concerns are not heard. According to recent reports, the employer is proposing wage increases ranging from 0.5% to 1.5%, all below inflation. Mokonyane said Cabinet received a briefing on the public sector wage negotiations and would ask that public servants and their representatives negotiate in the interest of overall public service. “Cabinet was briefed on the current public service wage negotiations. Cabinet urged the Department of Public Service and Administration together with the mandating committee to work expeditiously to resolve the impasse on wage negotiations,” said Mokonyane. The National Union of Metalworkers of South Africa, meanwhile, put its weight behind the bus strike and is demanding a 12% increase for bus drivers, among other things. Minister of Labour Mildred Oliphant and Minister of Transport Blade Nzimande remain in talks with bus operators and labour to break the deadlock. Operators offered a two-year deal with an 8% increase in one year and 8.5% the following year. “Cabinet calls on all stakeholders in the public transport sector to bring a speedy end to the national bus strike. We urge all parties to return to the negotiation table so as to reach an agreement that is in the best interest of all parties in the country,” she said.